Hatori's a little overwhelmed at the idea if shearing so many wooly bugs. That's a lot of wool! Capture from the Crunchyroll stream. 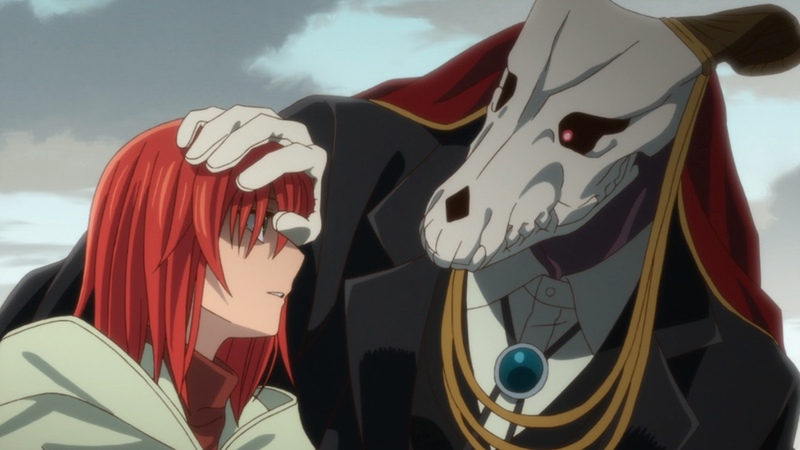 In The Ancient Magus’ Bride episode 14, “Looks breed love,” Redcurrant the Leannán Sídhe frantically asks for Chise Hatori’shelp: Joel Garland, the man she says she doesn’t love, is dying, and she’s desperate to save him. Can Hatori and Elias Ainsworthhelp the man? How far is Hatori willing to go? And will the Leannán Sídhe admit her true feelings before it’s too late? Elias' words trigger self-recriminations in Redcurrant. But she's honestly tried not to hurt Joel! Capture from the Crunchyroll stream. As Alice said they were "in the same boat," Hatori realized that she now had something she'd never had before: a friend. Capture from the Crunchyroll stream. 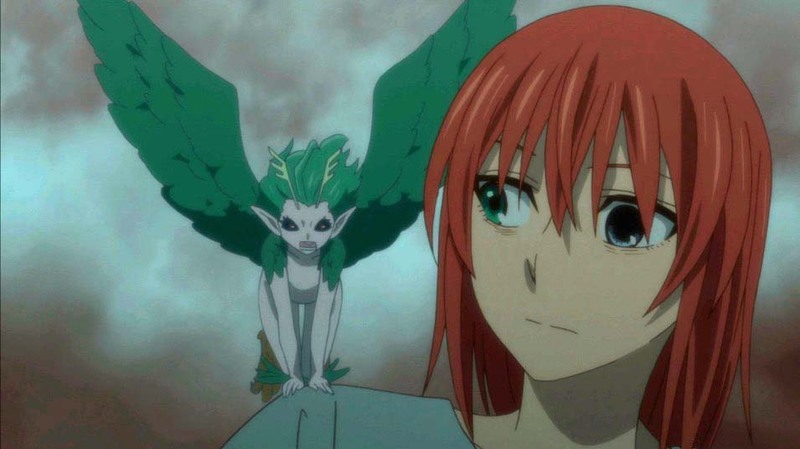 In The Ancient Magus’ Bride episode 19, “Any port in a storm,” Mikhail Renfred’s drunken confession is interrupted when Merituuli, the Selkie we met in previous episodes, visits the water cooler. 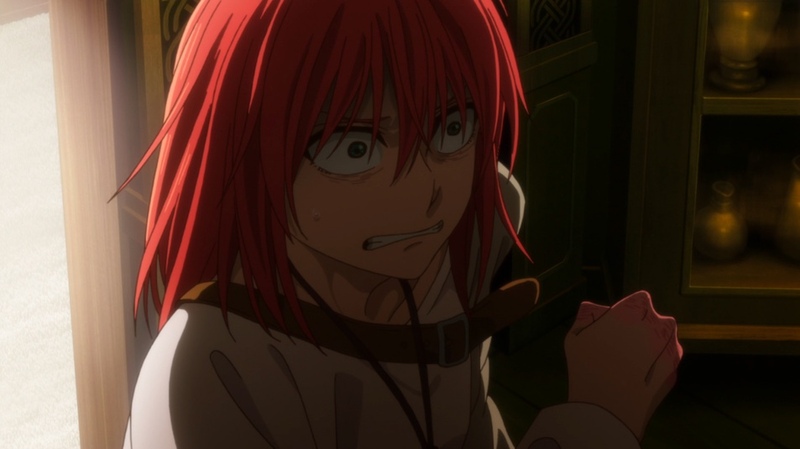 Chise Hatori has a terrifying vision involving Cartaphilus, and what he asks of her shocks her awake. 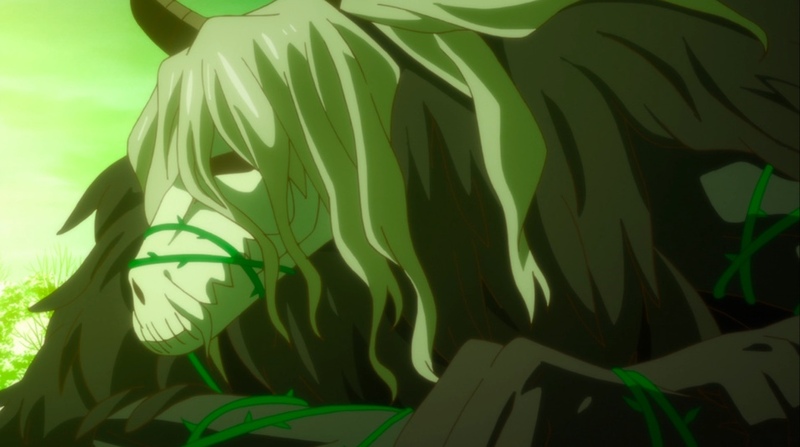 Mikhail and his sorcerer friends convince Elias Ainsworth — with a lot of help from Hatori — to work with them to track down the missing dragons from the last episode. Hatori’s vision sends them to an auction house that’s all too familiar to Hatori. There, she virtually meets a woman who offers to help her — but at what cost and why? And when the baby dragon goes up for auction and breaks free of its bonds, can Hatori and her friends stop it? 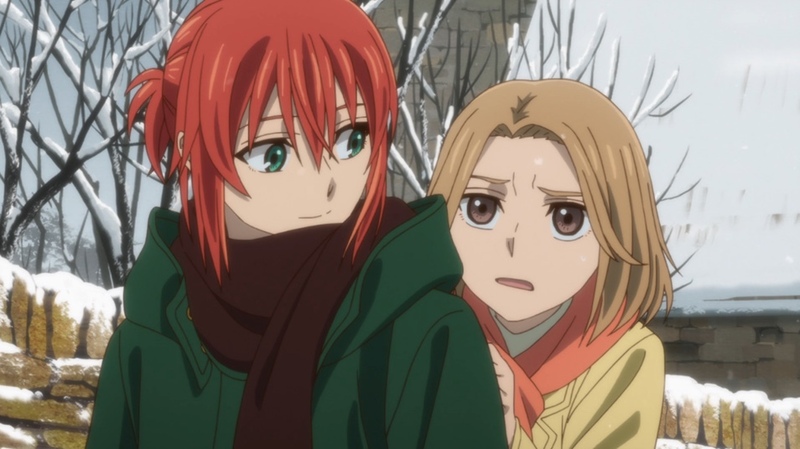 The dragon's emotions almost overthrow Hatori's mind before Elias can help her. Capture from the Crunchyroll stream. 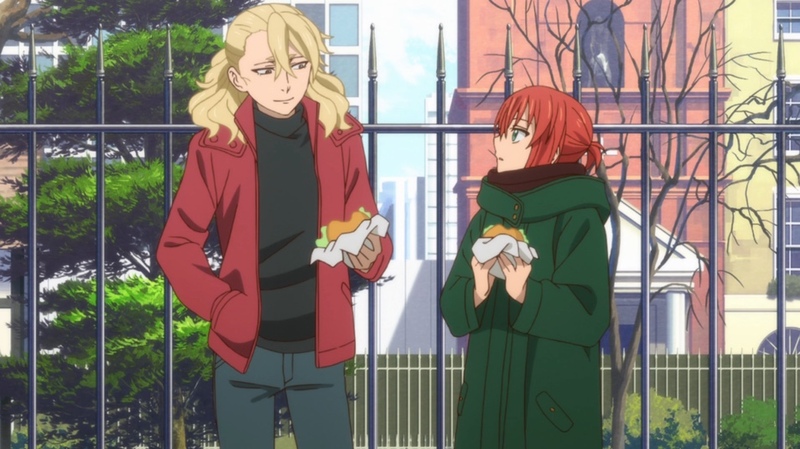 In The Ancient Magus’ Bride episode 20, “You can’t make an omelet without breaking a few eggs,” Chise Hatori and Elias Ainsworth come up with a plan to save the dragon. They leap on its back, but almost before they know it, they’re high above the city and Elias is falling to the ground. Hatori has to make a decision about how to save the dragon on her own, at great risk. Can she live with the consequences? And what about Mariel, the woman who tried to make a deal with Hatori at the end of the last episode — what was she after? And what will that cost Hatori? Hatori's decisions don't affect her alone. Elias, Ruth, and Silky all hurt when she hurts. She's beginning to understand that! Capture from the Crunchyroll stream. 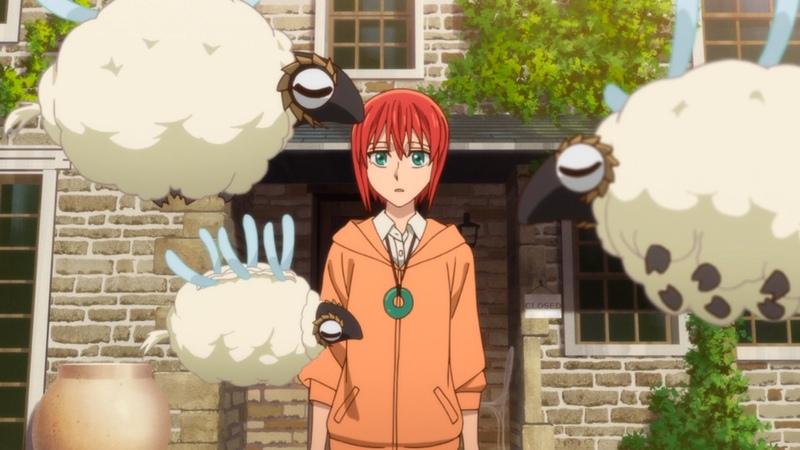 In The Ancient Magus’ Bride episode 21, “Necessity has no law,” Chise Hatori and Elias Ainsworth visit the witch’s coven at Mariel’s urging. But, it shouldn’t be a surprise that Hatori didn’t get exactly what she sought — though we can’t say she walked away empty handed. Later, Elias makes a terrible decision by himself, and he forces Ruth to help him. 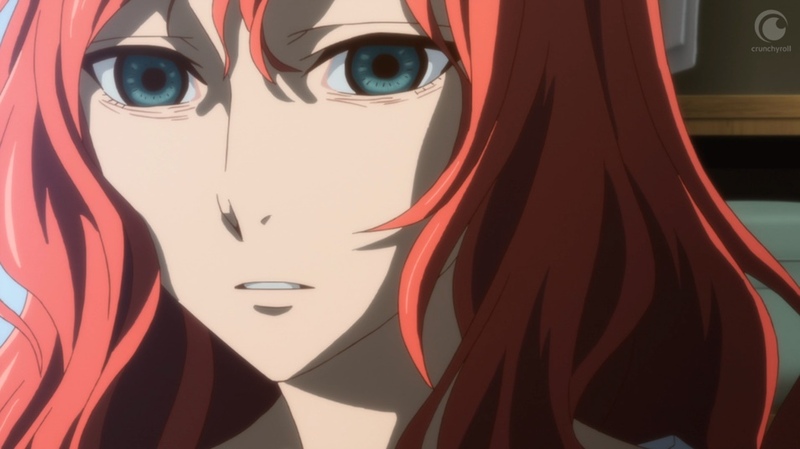 What will Hatori do when she discovers the lengths to which Elias will go to save her? And when will Cartaphilus make his move? This episode was tough on Hatori. And the next episode looks like it's going to be even worse. Capture from the Crunchyroll stream. 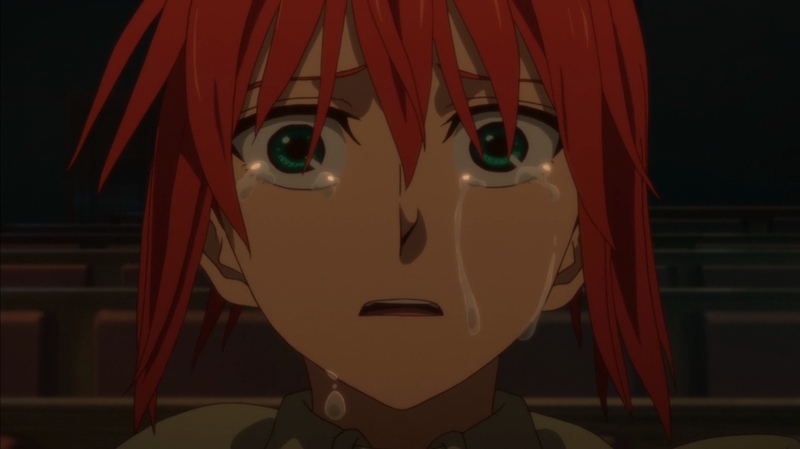 In The Ancient Magus’ Bride episode 22, “As you sow, so shall you reap,” Chise Hatori wakes up in Cartaphilus’ layer, Stella Barklem unconscious beside her. Using Stella as leverage, Cartaphilus makes it clear he wants Hatori’s dragon arm, but first, he has to test their compatibility in a terrible, terrible way. After that, he forces Hatori into her memories, where she relives the awful moments that had shaped her life before meeting Elias Ainsworth. Will she be able to survive the immersion in her own memories? And even if she does, what kind of person will she be? It is true that people are given no more than they can handle? The facts on the matter are pretty clear: No. Sometimes the world breaks people. People like Hatori's mom. Capture from the Crunchyroll stream. An agonized Elias turned down Titania and Oberon's offer. They wanted to bring the two back to the world of the Fae. Elias knew Hatori would never embrace that! Capture from the Crunchyroll stream. 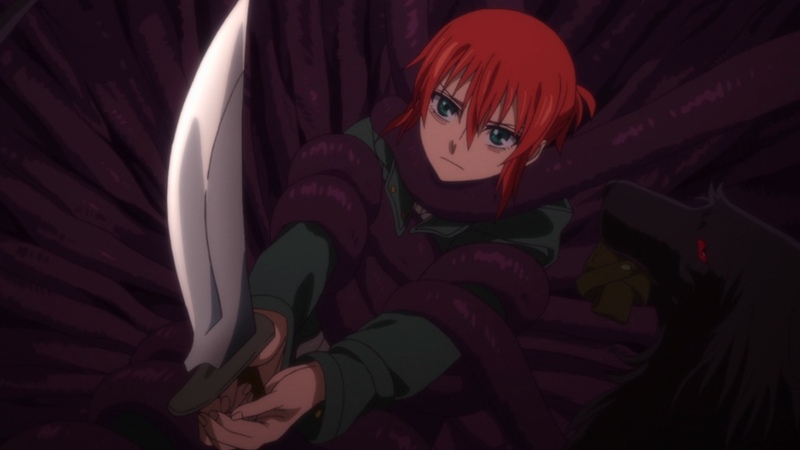 In The Ancient Magus’ Bride episode 24, “Live and let live,” Chise Hatori faces Cartaphilus, and this time she’s not alone: Elias Ainsworth and Ruth stand with her. Can they confront a being who’s immortal — and who gets unexpected help from Ashen Eye? And even if they can, how will Elias and Ruth withstand Hatori’s wrath after what they tried to do to Stella Barklem? Ariel doesn't like Elias. At all. But she was willing to put that aside to protect Hatori. Capture from the Crunchyroll stream.